Comments: slight water damage on top page edge, a few taped pages; does not affect readability Ships same or next business day with delivery confirmation. Acceptable condition. Contains highlighting. Expedited shipping available. 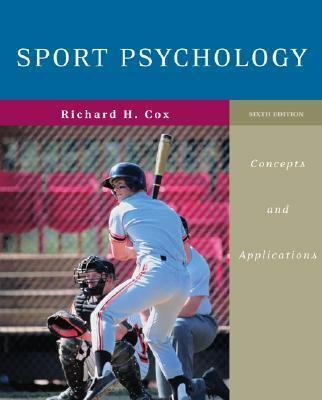 This introduction to sport and exercise psychology shows how principles supported by current scientific research can be used by physical educators, coaches, and athletes in everyday situations. It also addresses practical issues, such as dealing with anxiety, arousal, and stress; developing coping, relaxation, and energizing strategies; understanding the effects of an audience on human performance; building team cohesion; and preventing burnout.Cox, Richard H. is the author of 'Sport Psychology Concepts And Applications', published 2006 under ISBN 9780072972955 and ISBN 0072972955. Loading marketplace prices 39 copies from $1.97 How does the rental process work?